The Salvation Army, Miami Area Music Program was established for the growth of music education in the communities surrounding the four Corps/Community Centers in the Miami Area Command. Major Tom Overton, former-Miami Area Commander, envisioned a Music Program that reach at-risk youth in these Miami communities, following The Salvation Army tradition. Since September 5, 2004, music classes, which include theory courses and instrumental practice (brass) have been given to youngsters of Miami Citadel, Edison, Hialeah and Sunset. The program has become an opportunity for success and character building for young participants. Instruments: Bb Cornet, Bb Baritone, Bb Trombone, Bb Tuba, Eb Tuba etc..
Instruments: Drums, Bass guitar, Electric/Acoustic Guitar and vocals. The Salvation Army Miami Music Program is open to all youngsters in the community between the ages of 7 to 18 upon spot availability. In order to maintain membership in any of The Salvation Army music forces, participants must show good behavior and commit to the program’s disciplinary guidelines. Every member of The Salvation Army music sections or groups should be acquainted with the governing orders and regulations. 1. Supreme purpose: Salvation Army bands and songster brigades exist to proclaim the Army’s message: Salvation from sin through Jesus Christ; and to accomplish the Army’s purpose: The Salvation of souls. Praise God in his sanctuary; praise him in his might heaven! Praise him with a blast of the ram’s horns; praise with with the lyre and the harp! Income from our Red kettles supports our seasonal activities as well as other programs that benefit struggling individuals and families. Businesses, churches, civic clubs, schools, families, friends and individuals can sign up to ring at one of our kettle locations around Northeast Florida. There are many 2-hour, half-day, full-day and full week slots available. Sign up early to get your preferred location and dates! Volunteers with a clean driving record needed Monday through Saturday for pickup and delivery of items that assists the success of the delivery of the Christmas Programs. You must be able to lift, carry, load and unload at least 50 lbs. Volunteers are needed Monday through Saturday to assist the driver with pickup and delivery of items that contributes to the success of the delivery of the Christmas Programs. You must be able to lift, carry, load and unload at least 50 lbs. Our Food Pantry serves an average of 250 households with bagged groceries each week. Helpers – Volunteers are needed to assist with sorting, bagging and distributing food. Our Kitchen prepares and serves up to 1,500 meals weekly to the residents of the various programs of The Salvation as well as to the homeless and any one that comes to our door for meals. Individuals, families and groups are welcome to help cook and/or serve a meal to the homeless at The Salvation Army every day of the week. We ask that volunteers notify us a week in advance of when they would like to serve, and arrive 30 minutes prior to the shift. Kitchen Helper – Volunteers are needed to assist with food preparation, serving meals (cafeteria style) and general cleaning of the kitchen and dining areas. Volunteers can also assist with washing plate ware, glassware, silverware, pots/pans and kitchen utensils and place on specified shelves according to sanitation and cleaning procedures. Keeps dish areas clean by sweeping, mopping floors, wiping countertops, and emptying trash. Have you always wanted to help after a disaster but didn’t know how to get involved? Train now to be a Canteen volunteer! The Canteen is the response vehicle that The Salvation Army sends to local emergencies and to disaster stricken areas to serve food and beverage to survivors and service workers. Volunteers are needed to prepare and serve food and beverages, drive and set up the vehicle and clean and maintain the vehicle. Short term assignments are usually up to a 24 hour period and long term opportunities usually lasts up to 14 days. Volunteers are needed to give support to students academically in subject(s) our shelter children are seeking to improve. Instill the value of education for personal growth and development. Ability to communicate well with people of diverse backgrounds, maintain a non-judgmental attitude, be culturally sensitive. Patience is extremely helpful. A play room is provided with various books and learning materials. The ideal hours would be between 3:30 – 8 p.m. A maximum one hour of your time per visit. A background check is required. Rickey Smiley hosts morning show live from Salvation Army Miami Area Command! Valerie began working with The Salvation Army Miami Area Command in 1999 and was originally hired as a housekeeper. One year later, she was promoted to Case Aid Worker, where she worked directly with the shelter residents and Case Managers. Valerie also helped in other various positions such as Driver, where she drove shelter residents to and from appointments as well as joining the Emergency Disaster Relief team during a hurricane. Born and raised in Miami Gardens, Valerie is no stranger to the difficulties surrounding this neighborhood including drugs, poverty and gun violence. One year ago, Valerie’s son Tyquan Malik Ham was shot and killed in front of her home. This was a very difficult time for Valerie and she views her work with The Salvation Army as therapy. “Having the opportunity to see people walk away happy makes me happy. The compassionate clients that I speak with, helps me “Valerie Says. Valerie also spends a lot of time helping out in the food pantry filling boxes and distributing them to clients. In addition to her busy workload, Valerie is currently raising a four-year-old child. She relies on The Salvation Army’s Apple Tree program to assist her with this. 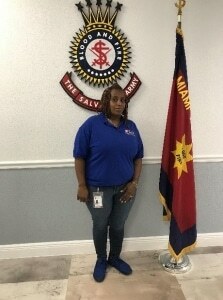 Marie first came to The Salvation Army Miami Area Command in July 2018.
regularly and accepted Christ as her Lord and Savior. that Marie could have stayed with; however, she did not want to be around voodoo worship. “Every time I stayed with my family, if I opened my bible they would turn out the lights” says Marie. “For the first time ever at The Salvation Army, I can sleep with both eyes closed” says Marie. Since coming to The Salvation Army, Marie has had many blessings. She has been reunited with her children and received three job offers. Additionally, Marie’s case manager Ana encouraged her to enroll in classes to obtain her security license. Having this license has allowed Marie to apply for jobs earning a higher wage and for that she is truly thankful. “I love The Salvation Army. If it wasn’t for them I wouldn’t have a place to stay. Here I can take out my bible and pray without having any fear. I love the Church services on Sundays and everyone here is so nice” says Marie. Marie has finally found peace at The Salvation Army. She is extremely motivated to continue moving forward in a positive way and we are certain God will be on her side. 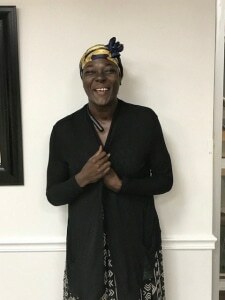 Katrina came to our shelter in April 2018 after her husband lost his job due to an illness that landed him in the hospital. Katrina and her four children tried to hang on for as long as they could but were not able to pay the rent and wound up homeless. They first began staying in hotels and their car, finally they were referred to The Salvation Army Miami Area Command. Shortly after arriving at The Salvation Army, Katrina got a job and began working full time hours. Katrina has been overjoyed about not having to worry about providing three meals a day for herself and her four children. “I can’t believe how difficult it is to find a shelter willing to take an entire family with both mom and dad. It’s been an enormous blessing to have our family stay together” says Katrina. Katrina was assigned a case manager, Rosa who also made a huge impact on Katrina and her family’s life. “Rosa was very understanding and gave me the courage and hope I needed to stay positive” says Katrina. 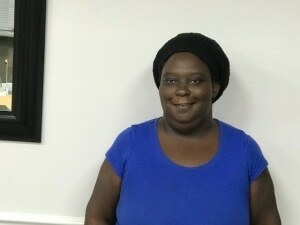 Katrina was recently notified that she was approved for housing and is looking forward to a fresh start. “I couldn’t have done this without The Salvation Army. All of our money would have gone into hotels.” Katrina still plans on visiting The Salvation Army and hopes one day to give back to the organization that saved her life. 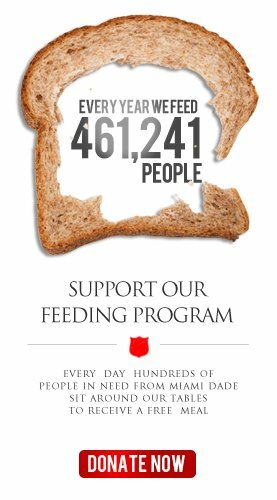 Below is a wish list of items that The Salvation Army could use to support its operations across the Miami-Dade area, serving those in the most need in our community. If you have something on the list you no longer need, please consider donating it to The Salvation Army. Other options range from purchasing an item to contribute or simply finding it in your heart to make a monetary contribution. Many of our clients are in need of furniture and bedding. However, the majority of the people we service rely on public transportation. Therefore, we are looking for portable furniture and bedding options that can be easily carried and transported by individuals and families. We are in need of Lowe’s Gift Cards to purchase folding tables and chairs for our clients. To accommodate the need for emergency beds and bedding, we need Walmart Gift Cards to purchase Raised Air Beds and Sleeping Bags. We appreciate the generosity of our donors, who provide many of the necessities we use each day. You can help us by keeping our food pantry full. A great way for your church, business, or organization to get involved is hosting a food drive. Help feed hungry men, women and children by conducting a food drive at work, school, church or in your neighborhood! Collect staples such as: Cereal, rice, pasta, instant potatoes. Canned fruits, vegetables and meats. Sugar, cooking oil, salt and pepper. Commercial sizes welcome!